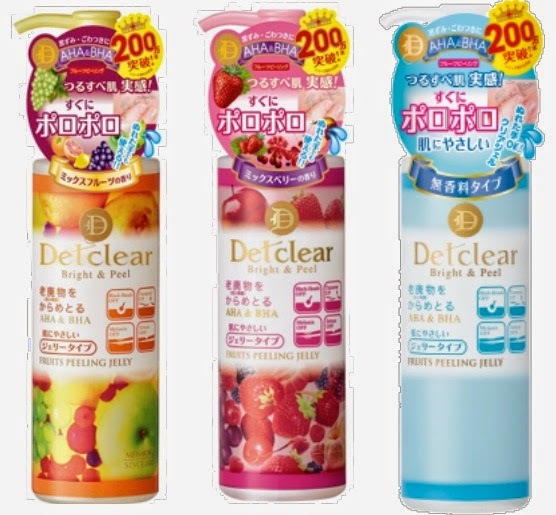 Meishoku Detclear Bright & Peel Peeling Jelly Fruits Scrub Wash a jelly scrub which you can use with wet hands! Remove Old Keratins with Crumbs!! Easy peeling even when you are in shower, you don’t have to dry your face and hands before using the scrub. Dead skin will be easily remove even when your face and hands are wet. Watery gel derived from Fruit AHA and Vegetable BHA. Gentle to skin peeling. By removing old keratins, it helps skin in absorption of essential extracts. Remove old extra keratins and make the skin radiant, fresh-looking, soft & smooth.